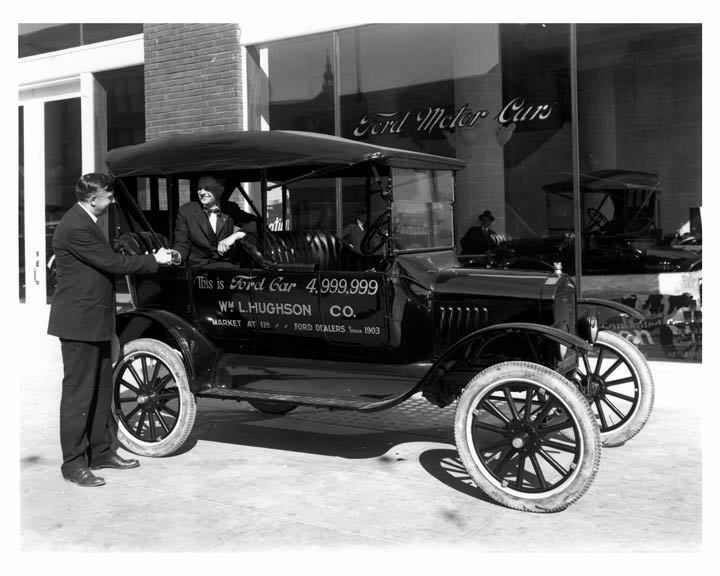 The William L. Hughson Company was founded by William L. Hughson (1869-1969) in 1902 after meeting Henry Ford and viewing one of his motor carriages at a bicycle show. Hughson bought twelve automobiles from the company and, based in San Francisco, became the first franchised Ford dealership, covering California, Oregon, Washington, Alaska, and Hawaii. The twelve cars remained unsold until 1906, when Hughson saved half of them from the April 18th conflagration. These autos proved essential during and after the disaster, and proved to many the value of the automobile. The William L. Hughson Company prospered in the years that followed, and finally closed in 1979. If you look closely at the photo you can see the seam under the guys extended arm to show this car had a 5 piece back on it. Seems like I have read on the forum that it was about this time when the 3 piece back began to appear. This always raises questions when dealing with the low cowl cars. Don't know for sure if an exact date can be determined for various reasons when it actually occurred but I guess it does show the 5 piece was still being used in May of 21. So while the new 3 piece style body was probably introduced the older 5 piece rear seat section style bodies were continued. With today's "Year Model" changes, we can often see that the new 2014 cars began production on date x,y,z at the a,b,c factory location. But with the Model T Fords I believe the majority of the changes were "running changes" and not tied to a nicely defined model year but were introduced along the way. Additionally with most of those changes there was overlap when both a new style part and an old style part were used. A well documented illustration of that was the change from the two piece valve cover block to the one piece valve cover block. Ref Bruce McCalley�s serial numbers and notes taken from the engine production logs. The first regular production one piece valve cover engine was assembled and serial number stamped on Nov 1, 1921 (ref page 526 Bruce McCalley �Model T Ford.�) The last two piece valve cover block was assembled at the main engine production facility Mar 31, 1922 (same page 526, McCalley). That would be 5 months of overlap when Ford was producing both styles of engines at the main engine plant at Highland Park. Note that one or more of the Branch locations that assembled engines may have assembled engines later than Mar 31, 1922 that had the two valve covers rather than the single valve cover. And in some cases even model year changes were overlapped with previous model years. The 1911 style touring bodies continued into early 1912 production. The 1912 Delivery Car continued to be produced in 1913 (needed to use up the bodies that had been ordered � and some would call it a 1912 even though it was built in late 1912 during the 1913 model year). [ref McCalley page 141]. Additionally the different branches continued to use up the parts they had to produce cars. 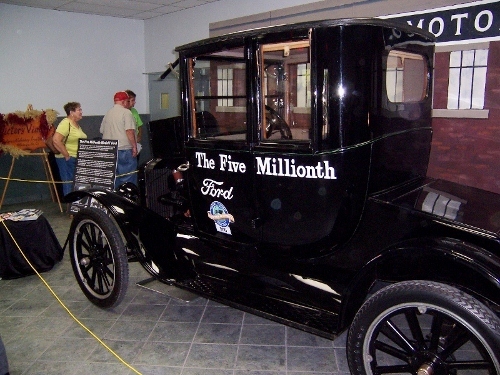 Note that Beaudett continued to supply Ford Motor Company USA with bodies until Jul 1922 (ref: http://www.mtfca.com/encyclo/A-B.htm scroll down to Bodies made by O.J. Beaudett.) So it is possible that the 4,999,999 car had a Beaudett body or one supplied by a different body maker and not one produced by Ford Motor Company. My theory is that Beaudett produced the 5 panel rear seat section bodies until the end of their deliveries in Jun � ish 1922. Does anyone know of some 1921 or 1922 USA produced Beaudett touring bodies with the 3 piece rear seat panel rather than the 5 piece rear panel seat tub? Or if you know of some with the 5 piece rear tub � would you please let us know that also? Here is 5,000,000. This photo was taken at the centennial but the car resides at the Smith Museum in Lincoln, NE.